THAT'S ALL THE BIBLE SAYS ABOUT JESUS FROM AGES 12 TO 30. WHERE WAS JESUS DURING THOSE YEARS? The Missing Years of Jesus, or as Catholics sometimes call them 'The Hidden Years of Jesus', have been the subject of much speculation. Many books have been written filled with conjecture and varying points of view about those years. 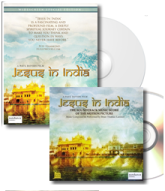 Directly following the opening credits, JESUS IN INDIA shows Edward T. Martin on his quest through narrow streets adjoining the Ganges River in Veranasi, India, as he cites an excerpted version of author Elizabeth Clare Prophet's ruminations on this subject. The quote that follows is used with permission of the publisher, Summit University Press. "Imagine that you are a detective. An unusual case comes across your desk. It isn’t exactly a case of a missing identity or a missing person, it’s a missing background. Some lost years. And the particulars are sparse. Date of birth unknown, exact year of birth also unknown. Sometimes between 8 and 4 B.C. Place of birth disputed. Thought to be Bethlehem. All human history divided by his birth – B.C. …. A.D. This is no small case. An investigation into the past of one of the most influential persons in history. By this time you realize what you might be getting into, but it doesn’t add up. Why a file on Jesus? You read on. Adventurous early life. Fled with parents to Egypt after father had a dream. Returned to Nazareth an unspecified number of years later. Was baptized by a cousin, John. Traveled extensively with a band of twelve disciples for about three years. Preached. Healed the sick. Raised the dead. Orthodox position: Rose from the dead on the third day. Taught disciples for forty days, then disappeared from their sight in a cloud. Ascended into heaven and sat on the right hand of God. The file. It is full of unanswered questions. No record made of his existence during his life. If made, did not survive. Nothing he may have written survived either. No record of what he looked like – height, weight, color of hair or eyes. Few details about his childhood. Little information about his family or home life. No record of any kind about where he was or what he was doing from age twelve to thirty, a period called the Lost Years of Jesus."